There are 45 Assisted Living Facilities in the Davison area, with 1 in Davison and 44 nearby. The average cost of assisted living in Davison is $2,590 per month. This is lower than the national median of $3,346. Cheaper nearby regions include Ortonville with an average starting cost of $2,000. To help you with your search, browse the 168 reviews below for assisted living facilities in Davison. On average, consumers rate assisted living in Davison 4.6 out of 5 stars. Better rated regions include Metamora with an average rating of 4.8 out of 5 stars. Caring.com has helped thousands of families find high-quality senior care. To speak with one of our Family Advisors about assisted living options and costs in Davison, call (855) 863-8283. Located in Genessee County, Davison is a suburb of Flint, Michigan. The senior population of Davison is 16.6 percent of its total population, similar to Michigan’s senior population of 16.7 percent. 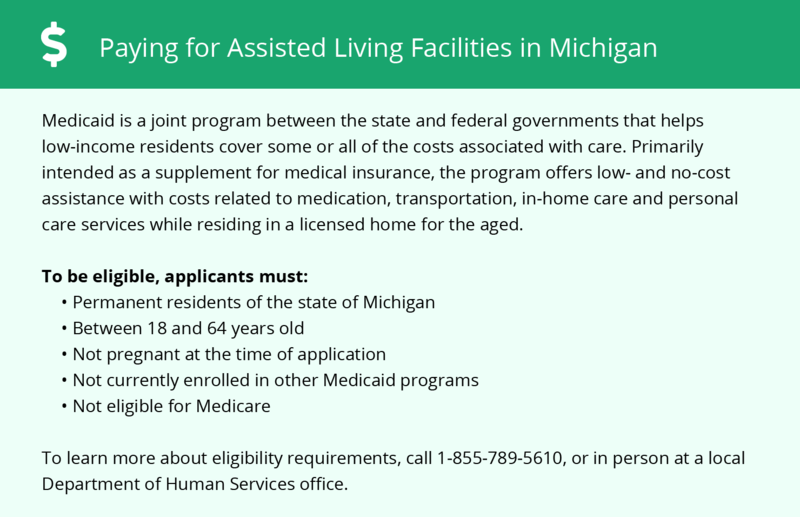 The Department of Human Services in Michigan regulates assisted living for that state, which includes homes for the aged and adult foster care. A home for the aged is for anyone over the age of 60, while an adult foster care home is for adults needing special care. The Davison area has a total of 61 assisted living facilities, with one in Davison itself and the other 60 in nearby towns like Metamora and Ortonville. Davison’s location on the eastern side of Michigan’s Lower Penninsula makes it subject to lake effects, generally resulting in a cold, windy climate for seniors who enjoy outdoor activities. The average low temperature in January is 15 degrees and the average high is 29 degrees. The average temperatures for Davison range from 60 to 81 degrees in July. The overall cost of living is relatively low in Davison, averaging about 88 percent of the national average. Seniors in assisted living facilities will be most affected by grocery expenses, which are almost 6 percent above the national average. All other essential expenses are close to the national average. Davison’ overall crime rate is about average since it’s safer than about 48 percent of the cities in the United States. However, the annual rate of violent crime is very low in Davison, at 1.22 per thousand people, which comfort seniors when they run errands. In comparison, the annual rate of violent crime in Michigan is 4.59 per thousand people and 4.0 for the United States. The Flint Mass Transportation Authority provides public transportation for the residents of Genesee County, including Davison. Senior citizens over the age of 65, people on Medicare and the disabled pay a discounted fare. The Davison Senior Center provides a full schedule of activities for senior citizens, including recreation, arts and crafts, education and fitness. It also provides a range of legal and medical services for seniors. Davison has few facilities from which to choose in the event of a medical emergency or illness, with the nearest major hospital located in Grand Blanc. Assisted Living costs in Davison start around $2,590 per month on average, while the nationwide average cost of assisted living is $4,000 per month, according to the latest figures from Genworth’s Cost of Care Survey. It’s important to note that assisted living rates in Davison and the surrounding suburbs can vary widely based on factors such as location, the level of care needed, apartment size and the types of amenities offered at each community. 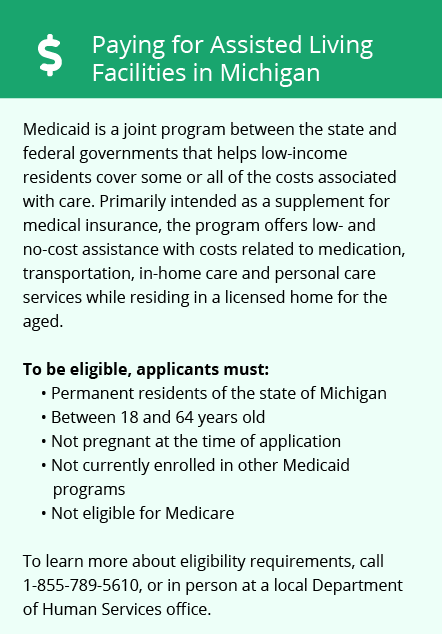 The Medicaid State Plan provides a range of personal care services for senior citizens in Michigan, including homes for the aged. Michigan also provides recipients of supplemental security income with an optional state supplement that places a cap on room and board charges, provided they reside in a home for the aged. Davison and the surrounding area are home to numerous government agencies and non-profit organizations offering help for seniors searching for or currently residing in an assisted living community. These organizations can also provide assistance in a number of other eldercare services such as geriatric care management, elder law advice, estate planning, finding home care and health and wellness programs. To see a list of free assisted living resources in Davison, please visit our Assisted Living in Michigan page. Davison-area assisted living communities must adhere to the comprehensive set of state laws and regulations that all assisted living communities in Michigan are required to follow. Visit our Assisted Living in Michigan page for more information about these laws.